After World War II, my mother moved north from a truck farm then outside of Houston, Texas with a taste for kidney and lima beans, okra and Fritos, a Texas cash crop since 1933. My father was from Brooklyn and his taste in vegetables ran to potatoes. Okra was available in the north primarily in cans. I believe the brand was Dixie Revenge, slime added for Yankees. My mother tried canned okra on us once. The chorus of “yucks” raised by my brother and me was greeted by reminders of the poor starving Belgians. I really don’t why my mother was so obsessed about Belgians when all the other mothers had moved on to starving Chinese. The starving okra-less Belgians might have been the end of the story had my father not been more articulate that he had no intention of even considering “this stuff” as food. So we never had “this stuff” again at home, although it was unavoidable when we visited my grandparents. I grew up and stopped worrying about Belgians.Okra had nothing to do with Maurizio’s Italian childhood (or starving Belgians either) and were happily okra-less for years. However, recently dear friends and fine cooks, Chuck and Melody, suggested we try again, grow up, in other words. 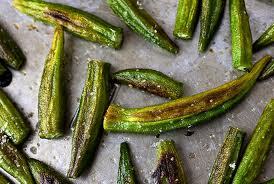 The idea is to slit the okra lengthwise, arrange on a tray, add salt, paprika, and olive oil and grill. They swore, they absolutely swore we’d love it. Hum. Sounded like a candidate for shipment to Brussels, but Maurizio bought okra, slit and gutted each pod (we weren’t sure the gutting was part of Melody’s plan but you can’t be too careful with slime). Oil, salt, paprika (lots), grill. And it was pretty good. Not crazy good, but no slime, and none left over for Belgians. Too bad for them. Let them eat chocolate.